While the Armed Forces Vocational Aptitude Battery, or ASVAB, test can’t actually be “failed,” you may decide you want to retake the test if you do not achieve an Armed Forces Qualification Test (AFQT) score that will allow you to get into the service you want or qualify for a particular job you are seeking. If you do decide that you want to retake the test and try to improve your AFQT score, there are a few things you need to know. The first thing applicants need to know is that the ASVAB has a retest policy that requires a wait time between tests. You must wait one-month from the date you took the initial ASVAB test to take a retest. That means if you took the test on May 20 you would need to wait until June 20 to retake it. You are then allowed to retake the test a second time one month after your first retest. That means if you took the retest on June 20, you would be eligible to take a second retest on July 20. After the second retest, you must then wait six months before you can take the test again. This six-month wait period applies to all subsequent tests as well. In addition to the wait time period, applicants may also be required to take a confirmation test (a C-Test) if they gain 20 or more points on their AFQT score in a six-month period. When taking a C-test, you can take it immediately – you do not need to wait one month or six months. If an applicant misses their scheduled C-Test, he or she can take a standard retest six months from the date of their originally scheduled C-Test. If you are committed to achieving a higher score on the ASVAB, one of the best things you can do is to use the wait time to study. Luckily, there are online study sites, such as ASVABTutor, that offer ASVAB practice tests and study guides that you can use to improve your knowledge in all four areas of the ASVAB, which are math knowledge skills, arithmetic reasoning skills, reading comprehension skills, and word knowledge skills. These are the four subtests which are used to calculate your AFQT score. ASVABTutor’s practice tests show you what areas you are already strong in and what areas you need to study more. Then the site’s study guides provide you with additional information and study tips that will allow you to boost your knowledge in specific areas and raise your test scores. You can take ASVABTutor’s practice tests an unlimited number of times to ensure you are fully prepared for the real ASVAB. So don’t waste your time with inferior tests that cover material not likely found on the ASVAB. Gain the knowledge you need to obtain a better score. The retake rules for the ASVAB are not the same across all service branches. Army – The Army allows a retest: if the applicant’s previous ASVAB test has expired; if the applicant failed to achieve an AFQT score high enough to qualify for enlistment; or if unusual circumstances have occurred, such as an applicant wasn’t able to complete the test. Air Force – Authorizes retesting when an applicant’s line scores (job qualification scores) limit the ability to match an Air Force skill with his or her qualifications. 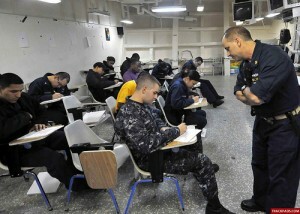 Navy – Allows applicants to retest if their previous ASVAB has expired or they have not achieved a qualifying AFQT score. Marine Corps – Authorizes retesting if a previous test has expired or when recruiters believe an applicant’s score does not reflect his or her true capability. Coast Guard – Allows retesting solely for the purpose of raising scores to qualify for a specific enlistment option. The military now offers a Prescreen, Internet-Delivered Computer Adaptive Test (PICAT) which applicants can take to let recruiters know they are qualified before having to go to a military entrance processing station or military entrance test site. This test, which is an un-proctored, full version of the ASVAB, can only be given to those whom have never taken the ASVAB exam. Once a potential recruit has taken the PICAT, they will then take a shorter verification test at MEPS to ensure they didn’t cheat. One important thing to remember when taking the ASVAB multiple times is that it is not your highest score that counts but rather your latest score. That means if you take the test and score lower, that most recent score will count instead of your older, higher score. That’s another reason why studying – such as at ASVABTutor – is so important during the retest waiting period. One more important thing to know – taking the ASVAB in high school does NOT count as an initial test and you can retake it within 30 days. By adhering to the rules and using the wait time to study more, it is possible for applicants to improve their ASVAB scores and qualify for the military branch and job of their dreams. Share your thoughts in the comments below. Rate this article: was this article helpful? 3.86 out of 5 based on 10 votes.